Welcome to the Star Gazer! Partial ocean-view decks, easy beach access, just a half block to Tolovana Park, and three distinct living areas make this large, rambling home the perfect place for fun family gatherings! Pets are welcome, and the home sleeps up to 12 people. The main level is on the second story, with a bright and sunny living/dining area adjacent to the fully equipped kitchen. There is a gas fireplace here, as well as TV/VCR and WiFi throughout the house. This room opens to the wonderful deck, where you can take in the breathtaking peeks of the ocean and mountains while you relax in the sunshine. Stairs lead to the fenced, grassy yard, as well as the parking area. There are two bedrooms on this level (one with a king-sized bed and peek ocean view and the second with a queen-sized bed) and a large bathroom with a shower. A cozy front living-room graces the west end of the home, facing the ocean and complete with gas fireplace, big-screen TV/DVD/VCR, and stereo! The downstairs is separated from the main part of the house by a garage, providing privacy if desired. There are two bedrooms (each with queen-sized bed), bathroom with a shower, living/dining area with gas fireplace, TV, and small view of the ocean. A microwave, and basic dishware are also provided here. The Star Gazer is located just one house from the beach in the south end of town (two miles from downtown), and just a block away from a two markets, a coffee shop and Tolovana Park (playground, picnic tables, restrooms). Enjoy the simple pleasure of walking to your destinations, and don't forget to check out the stars! 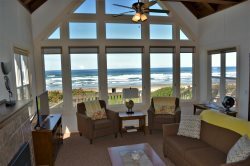 Cannon Beach Vacation Rentals offers these nearby homes: Beach Haven, SeaRae, Robar's. and Sea Breeze. This was the 3rd year for staying at the Star Gazer and when we first walked in this time it felt like we were home. Have used your Company on multiple occasions and think you give excellent customer service. Please don't let your property owners stop taking care of their properties. We count on you to be discriminating in the properties you represent. Each of the team members that I have encountered over the past two years have been caring, compassionate, and professional. They realize how important family vacation time is and it is obvious that they want to help in maximizing the experience. It was a fantastic time at the Star Gazer and my family is already looking forward to next year's stay. All members of the team were very helpful before and during our stay. Three of our four vehicles were broken into on the third night however nothing was taken. We are extremely sorry to hear about your vehicles. Cannon Beach has such a very low crime rate and our police department are vigilant. Our hope is that this will not prevent you from returning to Cannon Beach and CBVR in the future. The property was perfectly suited for 7 adults, 3 children and dog. The weather was great so we enjoyed the large deck with ample seating and beautiful view. Gathering spaces make this home perfect for our size group. The garage made it so easy to drop chairs, beach toys and shoes. We've stayed several times and have never been disappointed. I love to work with this company. The staff is knowledgeable about the properties and they are low key and friendly. The house was very clean. It was handy having the washer and dryer right on the property. The way the house is set up allows for time together as well as time apart. It is handy to the beach and has a great view even though it is not beach front. Thank you for your kind words about our staff and the house. We will contact the homeowners regarding the frying pan replacement and look forward to your return to Cannon Beach Vacation Rentals. We were in the house 5 minutes and my wife said we were going to come back next year.